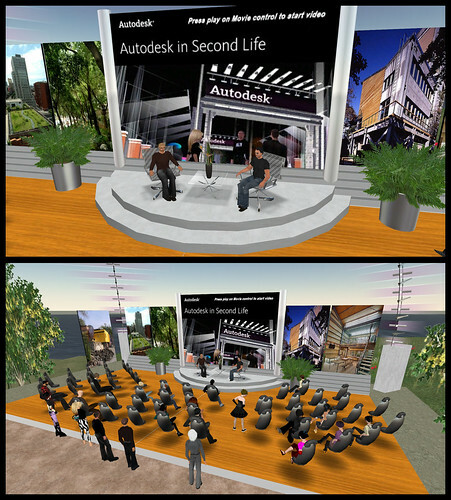 Thanks again to everyone who joined in the presentation and discussion this morning on Autodesk Island. You can find the transcript HERE. Attend this event on Autodesk Island HERE (SLurl). Jon Brouchoud (aka Keystone Bouchard), started his adventures in virtual reality by using Second Life as a professional tool for architectural collaboration, presentation and communication with his studio, Crescendo Design which focused on sustainable or environmentally friendly design. The Second Life platform proved to be immediately useful for several reasons. Crescendo Design’s business model was already largely dependent on web-based communication in order to collaborate with clients and builders throughout the Midwest from their studio in northern Wisconsin. With Second Life, they were able to invite clients into an immersive environment where they could literally walk into design concepts they had developed, and have meetings sitting ‘inside’ the designs instead of describing a drawing over the phone, or driving long distances for weekly meetings. 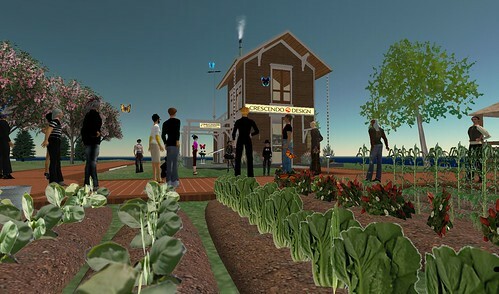 Second Life also proved helpful since their work focused on green design. Educating clients about the value and aesthetics of various concepts was an integral part of their process, so they depended on illustration and education to help build awareness of these principles. Second Life provided a unique medium for delivering those experiences. While it wasn’t a feasible replacement for the drawings and models they produce with Autodesk Architectural Desktop, the simplicity of the in-world building tools enabled Crescendo to use it as a more immersive and functional replacement for visualization tools like cardboard study models or loose sketches. More polished virtual models enabled clients to literally occupy and explore their soon-to-be new home. They could use it to test paint colors, material types and finishes, and could even use it to test furniture layouts and landscaping options. While Crescendo Design still uses Second Life as a professional tool, Jon has since transitioned into a full time role as ‘3D Experience Architect’ for Clear Ink in Berkeley, California. He is currently working toward the understanding, development and implementation of a new language of virtual architecture through a diverse range of Second Life projects at Clear Ink. Check out my post @ Clear Night Sky wrt the discussion Sergio Palleroni and Phil Bernstein gave on Autodesk Island. I haven’t tried this yet, but it sure looks promising. Time to dust off the tablet I bought last year, but could never get used to! Second Lifers will soon be enjoying a new level of visual realism through the introduction of lighting and atmospheric effects since Linden Lab’s purchase of WindLight. I’m not sure if they’re planning on full integration of the entire WindLight package, but I really like the looks of the daylight slider that automatically renders realtime shadows shown on the ‘urban’ video on THIS page. Read the press release HERE via Prion Design Group.